The first Tintin story I ever read was Cigars of the Pharoah, so that's what I decided to go with here. 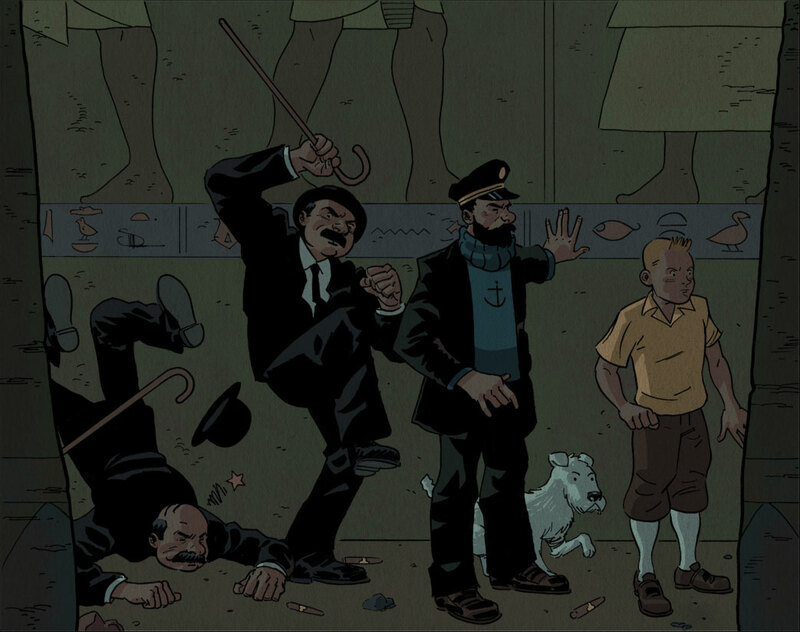 I know Captain Haddock wasn't a part of that story in particular but I couldn't pass up the chance to draw him. HOLY CRAPATOLLI, DUDE!!! that's tha bizness!! I would pay many fancy American dollars to see you do comic like this. This is awesome. Thanks guys! Mike- I've been playing the phrase "fancy American dollars" in my head over and over. Its the drawing you were born to do. You're like the Tintin messiah. Greatest characters of all time. Nice work here! What Mike said, but with Canadian dollars, which look prettier than American dollars, and don't smell like barf. Great stuff, Evan! Love the cartooning and the inks. Especially like the muted colours. You killed with that one, Evan.